Imperial Delay is designed to be a fast moving, powerful beast of a delay. It gives you complete control over every nuance of your delay, but does so in a way that doesn’t get in the way of your creative side. I’m obviously biased, but I no longer have any use for the other 12 delays I own. I just don’t need ’em anymore. Imperial Delay is hyper fast at “standard” delay stuff, hyper pretty when I want it, super nasty when I want it, and solves the “small room” sound which I never found an ITB replacement for the Eventide H3000. I think it’s the delay to end all delays and I couldn’t be more excited about the thing. 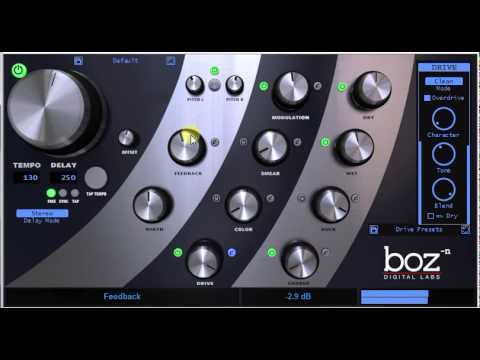 Stellar plugin! It’s worth $299, but don’t pay that. Catch it while it’s on sale for $59. I just downloaded this and played with it for 15 minutes, so I haven’t used it within the context of a mix – however I can already tell that it’s going to get a lot of use. The ducking feature is fantastic – it’s a parameter that every delay plugin should include. And there are a number of other fantastic color controls for the delay. It’s a very intuitive interface that encourages experimentation. One suggestion might be to add a bit more flexibility to the “Smear” parameters. There are currently Feedback, Size, and Low Pass Filter controls, but it might be nice to have a few more options with the Smear sound (maybe some different verb algorithms, a High Pass Filter, a Density / Diffusion control that doesn’t effect the verb time). But that’s being a bit nit-picky – I really think it’s going to become my go-to delay plugin. Thank you for making this. This is a really cool and different type of delay. There are a couple of minor issues which do not affect the performance of the plugin: 1) The on-off button does not link to the bypass button on AAX plugin (although both work independently), and (2) The presets folder opens as named presets but do not actually load the presets with the Windows AAX plugin. That being said, this is a delay unlike any of my other delay plugins–and it looks way cooler than any of my plugins (great graphic design). Boz definitely thought outside of the box with the design of this delay. The duck button is a stroke of genius for a delay plugin. Operation is very smooth with impressive sounding results. It turns out that if I just click on preset name and not folder button that the Imperial presets do in fact load, and they are some really wild and creative sounding presets. Completely trippy psychedelic if you want it. I messed around with it, so easy to get what you want. It can be subtle with a lot of control. Just listened to the video posted here, was sober, can only imagine how you can warp people’s brains who aren’t. One of the most flexible delays I’ve ever used. You can do any kind of delay you want. You want a classic slapback that you’d hear on something 40 years ago? Done. You want a ping pong delay? No problem. You want endless loops feeding back into itself and progressively sounds worse and worse as it loops through all the fx? No problem. You want delays that pitch shift each loop and then ducking abilities built right in? No prob. This this is nuts. The last 2 plugs Boz has put out has really changed his position in my book of great developers. I’m paying more attention to his future products now. I would suggest that you link the other videos that you have for the plug here. If I were to send a rock guy to this page (like myself), he would ignore as the only video up here is for some techno stuff. It is so much more than that stuff. I was lucky enough to venture to Recording Review to see the sale of the plugin (I’m a moderator at HR). I must say I am very impressed and have been playing with Imperial all week. Such ability with this thing. Props man! I have yet to really dig in and try all the features in depth, but I’ve used this on one mix so far, and the ease with which I was able to intuitively find the tones and effects I wanted was a pleasant surprise. The plugin is fun to use and inspires creative choices – definitely my new go-to delay plugin! Doesn’t seem to be a pig on resources either, even with several instances. just playing with the demo, but for the ducking feature alone makes it a done deal… never thought I’d be getting another delay when BF is pulling me elsewhere! Will up my rating after I spend some real time with it! Brilliant Delay control a plenty and The Ducking Feature is SO 2290 which I loved!!!! Heard it Loved it Bought It ,Buy it!! or you’ll regret It. It’s an absolutely workhorse…I needed something extra than a reverb sometimes can’t do. My delays weren’t capable of so much, this was just what my ears (and mix) needed. I use it on almost anything, but bass. Well, I’ve had a LENGTHY live in with the Imperial Delay (the name should be “Imperial EVERYTHING”, IMO) and the update recently was a welcome addition. 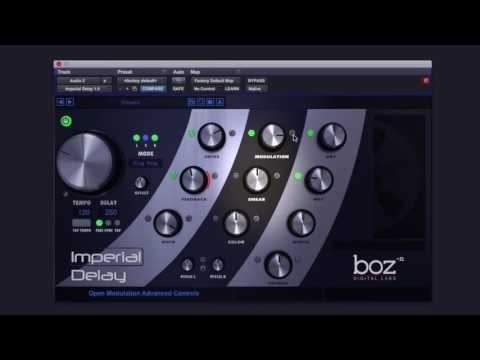 I have instances of Imperial Delay (current version 2) permanently installed in my main recording in both my Delay and Chorus FX Busses, and for good reason. This software handles BOTH those tasks in the most musically hip way, which an incredible array of permutations. Yes I have 2 other vendor’s software on both those busses (turned off, of course), but haven’t seen the need to switch off the ID. I was fortunate to have purchased it for the ridiculously low introductory price. I’ll state here and now, it’s worth the listed price. More than occasionally, BDL excellent specials on their software. I’d jump on this, and most anything else they make. “Mom warned us”, and what the sound does, has to be the best patch name in any plugin, ever.